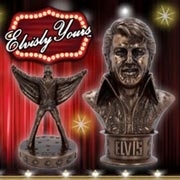 Perfect for any fan of the King. Have the King Himself with you wherever you go with this magnificent Elvisly Yours Wallet, exclusively available through Nemesis Now. Appearing as he did at his world-famous Aloha From Hawaii By Satellite concert, Elvis has his eyes closed, singing intensely. The collar of his white jumpsuit rising up to cover his neck covered in jewels. The name "ELVIS", is emblazoned behind him with lights illuminating his stage. With plenty of space for your cash and cards, this Wallet is perfect for any Rock and Roll star.